[prMac.com] Mumbai, India - Optimized for office walls, the newly released Numerics tvOS app gives teams a real-time status of their key performance indicators. Designed to be presented on large TV screens in a unique, big screen UI, Numerics runs on tvOS 11 and takes advantage of the intuitive Siri Remote enabling a tactile user experience. Custom designed, focus driven controls simplify navigation across dashboards while bringing unique interactivity to the KPIs. A slideshow mode automatically scrolls through KPIs on a dashboard - use it to rotate through and present shared KPIs. Redesigned from ground up, the Numerics v5 app for iOS uses cutting-edge iOS 11 technologies and frameworks to deliver an experience optimized for iPhone and iPad. Smooth animations, fresh typography, new and colorful visualizations, pleasant sounds, all make the new Numerics dashboards a delight to use. Thoughtfully crafted, Numerics v5 is not a mere iteration, its a whole new app experience. It adds support for new visualization types; interact with the colorful pie charts to sum pie slices or use the radar style day density charts to track cyclic data. Numerics 5 also adds support for the Super Retina screen of iPhone X. Numerics v5 has been tailored to elegantly fit the edge to edge screen of the iPhone X in portrait and landscape modes with support for the new gestures. Support for FaceID to unlock Numerics enables a powerful and secure authentication system for dashboards. Numerics on Apple Watch has a fresh new look, with left aligned KPIs, bold typography and refreshed colors. Re-engineered notification engine ensures you are always up-do-date about changes in your KPIs. 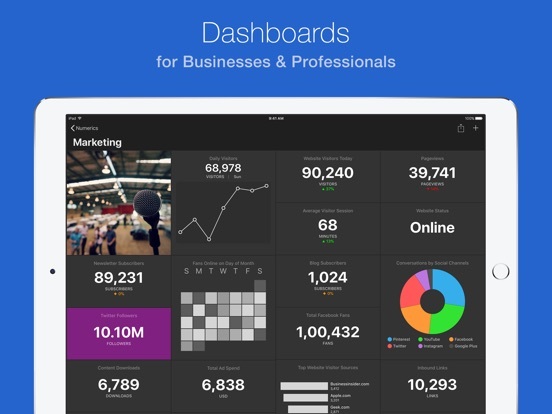 Numerics v5 introduces state-of-the-art iCloud Sync enabling users to design dashboards once and use them everywhere. With iCloud Sync, all the dashboards are kept in sync and are always updated on all your iCloud connected devices. Numerics v5 also adds some of the most user requested integrations to track KPIs from, including Microsoft Excel Office 365, Todoist, Shopify and App Figures Ratings. Cynapse is proud to be a new Apple mobility partner, allowing the company to leverage Apple's expertise in design and customer experience, as well as reach with hundreds of millions of devices, to bring solutions like Numerics v5 to more businesses around the world. "Numerics was created to connect and pull the most relevant KPIs from any business software and present them beautifully as dashboards on devices of all sizes. As an Apple mobility partner, Cynapse is able to connect Numerics to a diverse set of business applications with the aim of providing a tightly integrated dashboard solution to business users of Apple devices." said Apurva Roy Choudhury, CEO, Cynapse. "We've also gained deep market and platform insights that have been a key catalyst to the realization of the new Numerics experience on Apple TV." Numerics v5 will now be available as a free download on the App Store with many free services available for users to track their KPIs. Numerics Pro is an in-app subscription with a monthly and annual option. Pro unlocks access to all integrated services, allows adding of unlimited dashboards & widgets. The in-app Pro subscription comes with a 7-day trial that can be cancelled at anytime. To show gratitude for their support, all existing users are being grandfathered, along with an exclusive lifetime discount of 50% for Numerics Pro and an extended month long trial period. Numerics is a universal app for iOS, watchOS and tvOS. Numerics 5 is available worldwide exclusively on the App Store. Headquartered in Mumbai, India, Cynapse invents technology that applies to and benefits everyday life. Cynapse creates products that solve specific fundamental problems in the most beautiful and amazing way. Cynapse has successfully produced 10 products in its lifespan, focused in the areas of productivity and collaboration. Cynapse is the creator of open source Enterprise 2.0 software Cyn.in, provider of the realtime collaboration software Sync.in and inventor of Numerics, Localscope and Phlo for the iOS and Mac platforms. Over 100,000 businesses and institutions and millions of users across the world benefit using Cynapse technology. Copyright (C) 2017 Cynapse. All Rights Reserved. Apple, the Apple logo, iPhone, iPod and iPad are registered trademarks of Apple Inc. in the U.S. and/or other countries.